Got lots of magazine-style content and need a stylish frame? 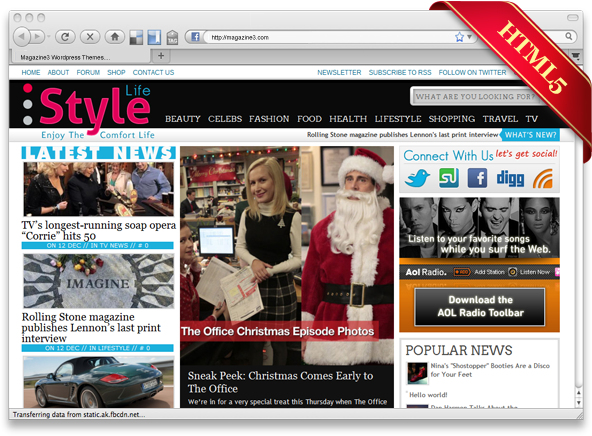 Lifestyle’s a great choice for sites that have a lot to say. Choose from five content-friendly soft color schemes, and widgets that support everything from video to in-depth articles to great photography. Red Carpet is a top class entertainment WordPress theme. This theme is the perfect choice and complete solution for celebrity, gossip, fashion, or entertainment blogs. This theme is bundled with premium media publishing features that makes entertainment blogging really fun. A fresh and flexible magazine theme for building a Celebrity-Fashion-Gossip oriented website with 2 different styles, Aqua and Pink. The theme is packed full of features with a Carousel Article Slider for Top Stories, Banner Campaign Management, Flickr, Video and Feedburner integration, ready for submission of stories to the most popular social network sites with plugin integration.